You Pandaren, you’re all the same. Always overdressing for the wrong occasions. Okay, so this set breaks a few of my rules (a number of pieces are from the same set), but it’s for a good cause. 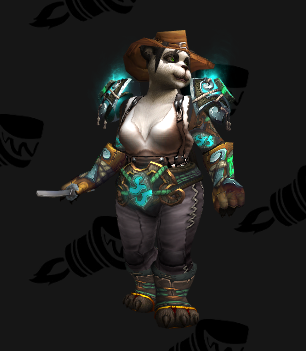 I’ve wanted a solid leather transmog for my archeologist-slash-adventurer rogue alt for a while now and this combines regular clothes and mysterious swirling relics in a way that appeals to me greatly. She feels like a treasure hunter, with a simple dagger at her side and a morally ambiguous relationship with the law when it comes to historical site desecration. Part of Lae’s Alt Appreciation series. And the Devil Wears Transmog runs on Blizzard’s Tuesday maintenance schedule so, uh, I’m not late. For another five hours. 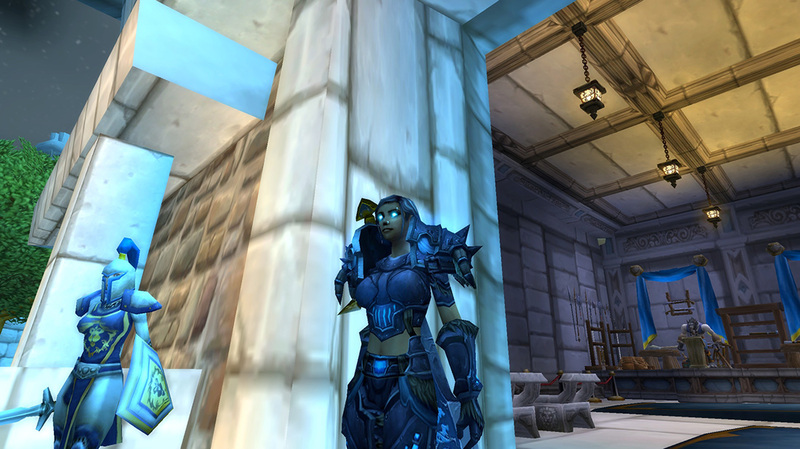 Prior the announcement of #DeathKnightWeek, I didn’t have a Death Knight. Well, that’s not true. 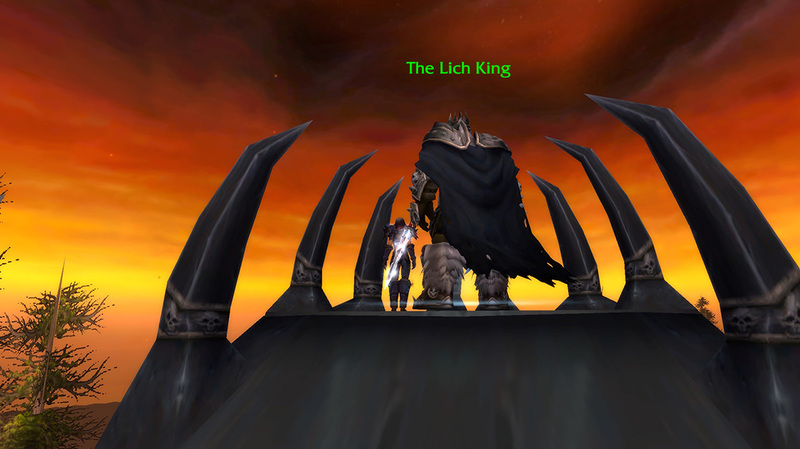 I had lots of Death Knights, deleted, abandoned or dead on other servers. This is what happens when you’re the sort of person who regularly bumps up against the 50 character account limit. But I wanted a Death Knight I’d actually play, so I sauntered over to one of my less populated servers and rolled Mortuary. 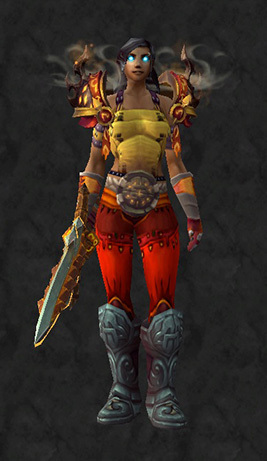 For all my love of transmog, I like the DK starting zone gear enough I’ll probably leave her like this ’til 90. Likes: piña coladas, long walks on the beach, and posing dramatically in front of large, glowing objects. A touching moment between mount and rider in the shadow of a Havenshire outhouse. He’s kind of cute. You know, for a twelve-foot tall force of pure evil. 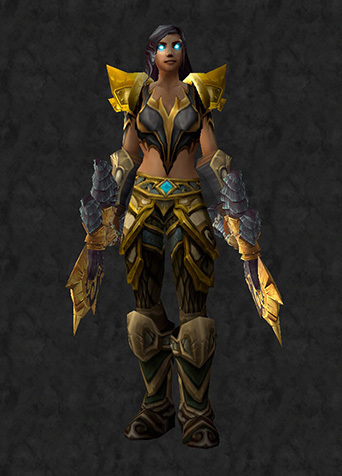 But it wouldn’t be a Devil Wears Transmog post without some ill-conceived fashion suggestions, so away we go! You’ll notice this round looks a little different. This time, I’ve turned to MogIt and, frankly, the results are great enough that I think I’ll be using MogIt exclusively from now on. Okay, so an argument could be made that those boots don’t really work, but I don’t care. They’re gorgeous and look heavy enough to smash a man’s face in, both important qualities for any fashionable Death Knight. 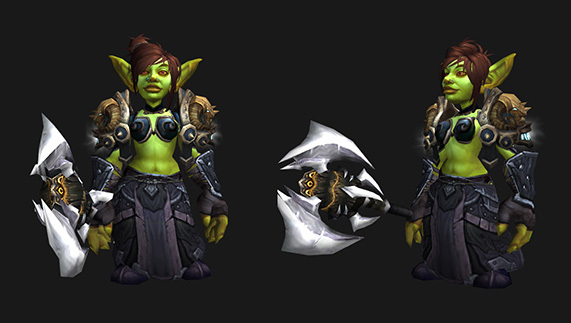 That said, none of these pieces are locked to a particular class or faction, so have fun! 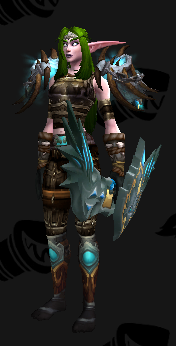 Okay, so maybe this transmog isn’t breaking any new ground, but I think the blue in the belt with the blue in her eyes makes this a solid alternative to a Death Knight’s usual parade of skulls and spikes. Again, there’s nothing here that’s locked to a particular class, but those axes — in that color, anyway — are only available for Alliance players. Next up, #DruidWeek! 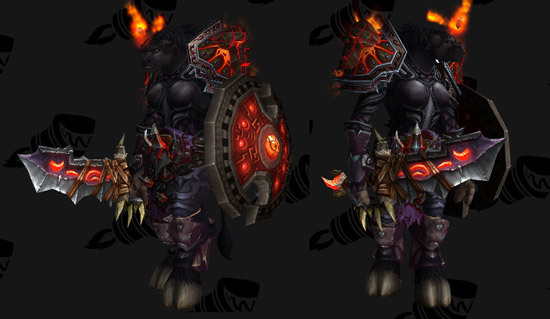 Bring on the… uh, worgen. I swear I’m a Hordie. I swear. Okay, note to self — Next time, use the female Troll for maximum irony. You know what, I’m not even going to bother screen capturing this set on a male toon. It’s… it’s a hot mess. There isn’t a tabard in the world that could save it. 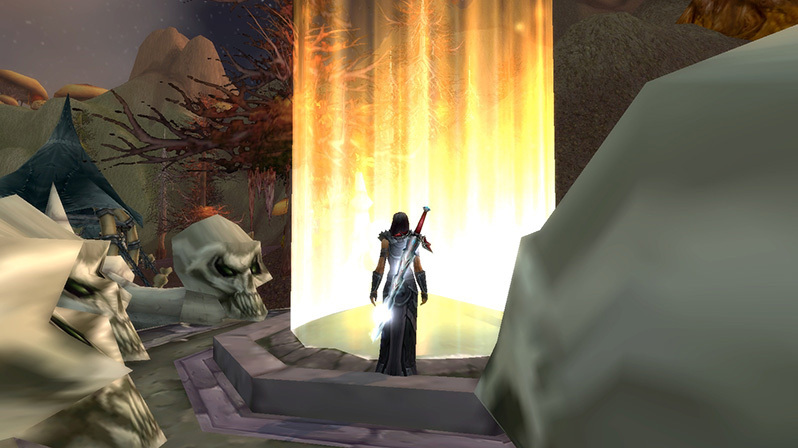 And yes, when I’m designing sets I’m using a female Blood Elf as a default, why do you ask?